A training programme on “Freshwater aquaculture as livelihood option for tribal youths” started at ICAR-Central Institute of Freshwater Aquaculture, Kausalyaganga, Bhubaneswar on November 14 which will continue till November 17. The programme is sponsored by 5/5 Gorkha Rifles (Frontier Force), Indian Army, Assam. In total 22 persons are participating in the programme. The inaugural function, Col DD Swain, Commanding Officer, Bihar Regiment, 120 Battalion, Indian Army, Bhubaneswar, was the chief guest. He appreciated the role of Indian Army in exposing the unemployed tribal youths to scientific aquaculture practices. Director, ICAR-CIFA Dr Bindu R Pillai presiding over the function highlighted the role of ICAR-CIFA for dissemination of freshwater aquaculture technologies to the tribal areas of the country, including north eastern hilly States. She encouraged the participants to get knowledge about fish culture from ICAR-CIFA and use it for their livelihood development. Principal Scientist and Chairman, Tribal Sub Plan Programme of ICAR-CIFA Dr BC Mohapatra welcomed the participants and guests. 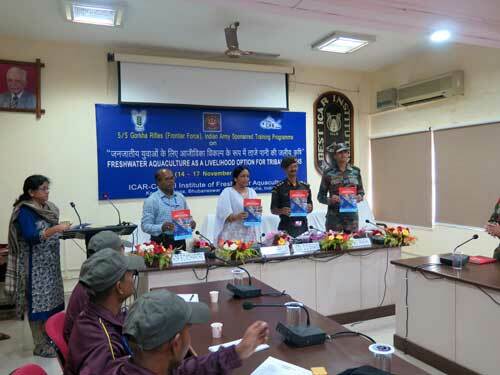 Capt ShivanshTripathi, 5/5 Gorkha Rifles (Frontier Force), Indian Army, Assam thanked ICAR-CIFA for conducting the programme for tribal youths of Assam. Principal Scientist and Course Director, ICAR-CIFA Dr Pravati K Sahoo proposed the vote of thanks. Dr I Shivaraman and Nitish Kumar Chandan, Scientists, acted as course coordinators.